The Camera can be found in your Item list. When accessed, the Camera enables players to take pictures of wild Pokémon encounters, without needing to take a screenshot. This allows players to take quickly take pictures of special encounters that can be stored and shared with friends and teammates. 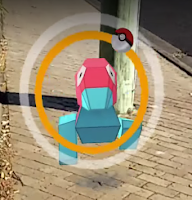 The Camera feature is very similar to that of an older N64 Pokemon game, Pokemon Snap.